I'm usually not a fan of full-on gourmand perfumes, but when I smell a good one, I can appreciate it. Hilde Soliani's Hot Milk provides a two-course meal: a savory entree followed by dessert. As Hot Milk segues into its mid-development, the main course is cleared away and desserts arrive on a silver platter. Suddenly, vanilla beans, perhaps some cardamom, and sugar are added to simmering cream, and produce scents that bring to mind sweetened Thai rice and Indian sweets: burfi (a milk-based confection) and kheer (a rich rice pudding). Hot Milk fired up my imagination and made me venture beyond Asia: what about a gelato flavored with vanilla beans and hot chilies...or maybe a creamy/icy cocktail, on the verge of being a milk shake, spiked with cold vodka? Hot Milk's extreme dry-down reproduces the scent of buttery vanilla cookies. As they say: it's ALL good! Hot Milk lasts a long time on skin and has mild sillage; to me, it's firmly in the unisex category. I've not had the chance to wear Hot Milk on a warm day, but it's perfect in cool weather. Hilde Soliani Hot Milk Eau de Parfum is available at Luckyscent, $160 for 100 ml. 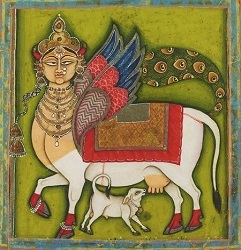 Note: top image of Kamadhenu, The Wish-Granting Cow [cropped] via Wikimedia Commons. Coincidentally, I was testing Hilde Soliani’s Bell’ Antonio last night. Not sure if I like it or if the tobacco is too strong and cigarette-like. I’d like to see what it smells like on a guy’s skin. Now you have me very curious about Hot Milk! Speaking of deserts, I had a frozen mango-flavored kulfi pop at a Pakistani restaurant recently that was AMAZING!!! The mango flavor was subtle, and didn’t overwhelm the almost slightly caramelized flavor and richness of the kulfi. The texture was agreeable, too. The wrapper suggested it was manufactured rather than something they had made themselves, so I recommend looking for it. That dessert sounds yummy. I own and love L’Aromatica’s Kulfi perfume. Kindcrow…just looked up Kulfi…will have to try some from that line! I agree, L’ Aromatica’s Kulfi is amazing if you want the exact experience of that dessert in a perfume. DSH’s Au Lac is similar as it also is quietly creamy without the overload of sugar that would push it into overt gourmand territory. Holly: don’t think I’ve tried any L’Aromatica scents…will remedy that. Noz…a good friend of mine makes kulfi pops with LOTS of chili…a nice mix of cool and hot. Sounds like Hilde Soliani made Hot Milk for YOU, Kevin! noz: even though I have a weird flu right now…I wanted to EAT … and Thai food always makes me feel good when I’m having a cold or the flu. Let me fix the last part of that sentence for you: Thai food always makes me feel good. I could live on Thai and be perfectly happy. Yep. One can almost see the vitamines kicking in. Wow, that sounds weird. Sometimes I like weird, will have to give it a try. Sariah, do give it a sniff. Furriner: it delivers on its promises! I definitely need to try this. It sounds like it shares quite a few notes with Etat Libre’s Fils de Dieu which I would like very much were it not for the coriander note which throws me off a bit. This one sounds in all ways yummier. Kathryn: this one is much more gourmand than Fils de Dieu if I remember correctly. Sounds really interesting Kevin, this brand doesn’t seem to be available in the UK unfortunately tho, such a shame as the website looks nice and the perfumes sound intriguing. Do u know are there many stockists in Italy?, we might be going in the summer but I’m not sure where. 1. Wow! There’s a Wish-Granting Cow? I want one!! 3. Wow! I’ve never sought out any Hilde Soliani scents before, but this one sounds good! FearsMice, i have always wanted a cow…one that grants wishes would get her own room!